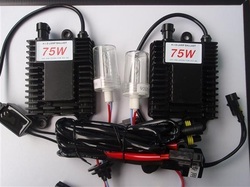 The manufacturer of this kit is BQ and has stabilized high power ballasts to the highest degree. With a measured output of 80w RMS and a sensitivity of 92% this ballast is perfect for off road racing. Each kit has a thick metal case with huge cooling fins to keep the ballast heat to a minimum and mounting bolts to make sure they stay secure when your race is on! 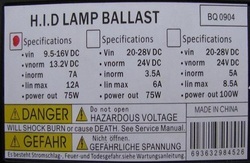 BQ has been in the HIGH POWER HID system for many years, their design today has been an accomplishment of years and years of research and design. Their ceramic based bulbs have been powered with 150w ballasts with no problems and long life. When you want the brightest look no further.